Lion is a Game & Watch game released as a part of the Gold series on April 29, 1981. It is also an unlockable minigame in Game & Watch Gallery 3. Only the Classic version is playable in the port. Here, lions are on the loose, forcing the lion tamers to use chairs to keep the lions in their cage. Each time the player keeps a lion in a cage, they earn two points. As the game progresses, the lions will move faster. If a lion escapes, the player gets a miss. At 200 and 500 points, any misses the player has will be cleared. When the player gets three misses, they receive a Game Over. Game A has two lions, while Game B has three. Lion appears as a microgame in WarioWare: Touched! 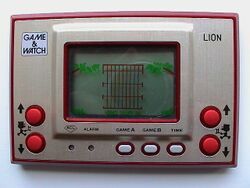 called Game & Watch Lion. It is Mr. Game & Watch's side-tilt move in the Super Smash Bros. series. In these games, Mr. Game & Watch pulls out a chair to keep enemies away. In the stages Flat Zone 2 and Flat Zone X, there is a model based on Lion, and players fill the roles of the lions. G&W Lion (04/1981) Back in the day, there were a lot of kids into the Game & Watch series. Quite a few adults as well, honestly. This game was a popular pick, with players controlling two zookeepers as they tried to keep the lions from escaping. The built-in clock was great for keeping track of your time spent playing! In an era before the Game Boy, countless children were enthralled by Game & Watch systems. And plenty of grown-ups, too! This game, Lion, is one such title that often proved hard to put down. The aim is to use two zoo keepers to stop the lions escaping their cage. At least the built-in clock can help you keep track of the hours you've lost! This page was last edited on March 21, 2019, at 19:43.